Following laminitis, infection sometimes develops in the feet due to dead tissue and blood vessel damage. Sterile maggots can be used to eat the dead tissue and stimulate healing. How to use sterile maggot debridement therapy for foot infections of the horse. Proceedings of the Annual Convention of the American Association Equine Practitioners. Seattle (WA): AAEP; 2005. Does magnesium help with insulin dysregulation/EMS/weight loss? 5 horses (mean age 14.2) with EMS, diagnosed from CGIT results, were fed 30 mg/kg BW magnesium as magnesium aspartate hydrochloride for 3 months. No adverse effects were seen. There were no significant changes in body weight, BCS (7-8/9 before and after treatment) and cresty neck score (3-4/5 before and after treatment). Serum magnesium concentrations were within the normal range before supplementation with magnesium, and there were slight but not significant changes in serum magnesium concentration after supplementation. There were no significant changes in ACTH, RISQI, MIRG, GGT and triglycerides. 3/5 horses had improved CGIT results. TLS comment: How much magnesium was in the diet before supplementation? What was the diet? What time of year was the research carried out - during the seasonal rise (August to October) there may be a natural increase in insulin resistance. What were the baseline insulin and glucose concentrations - why are RISQI and MIRG given and not the baseline insulin and glucose results? No controls were used - improvements may have had nothing to do with supplementation - experiments should always be controlled! Note there were no improvements in body condition score or cresty neck score after 3 months of magnesium supplementation. Conclusions: "The supplement containing chromium and magnesium evaluated in this study did not alter morphometric measurements, blood variables, resting insulin concentrations or insulin sensitivity in laminitic obese horses." "Magnesium (Mg) is an essential macroelement that is required for cellular energy-dependent reactions involving adenosine triphosphate and for the regulation of calcium channel function. Subclinical hypomagnesemia is common in critically ill humans and animals and increases the severity of the systemic inflammatory response syndrome; worsens the systemic response to endotoxins; and can lead to ileus, cardiac arrhythmias, refractory hypokalemia, and hypocalcemia. This article discusses the clinical signs, consequences, and treatment of hypomagnesemia in horses and describes the association of Mg and endotoxemia, insulin resistance, and brain injury." This in-depth article on magnesium deficiency in horses suggests that whole body chronic magnesium deficiency is rare in horses, and that supplementation is unlikely to be necessary when a horse is fed a normal diet. However, supplementation with magnesium is unlikely to harm a horse with healthy kidney function. There are anecdotal reports that supplementing magnesium can help reduce cresty necks and the incidence of laminitis, but currently there is no published research to support this. which concluded: "oral magnesium supplementation for 4-16 weeks may be effective in reducing plasma fasting glucose levels and raising HDL cholesterol in patients with Type 2 diabetes, although the long-term benefits and safety of magnesium treatment on glycaemic control remain to be determined", but only in people who were deficient in magnesium before supplementation. Could magnetic therapy help horses with laminitis? Any claims made by companies selling magnetic therapy products should be backed by peer-reviewed published research. TLS has yet to find any research supporting the efficacy of magnetic therapy for horses or humans. "Results suggest that in horses, the static magnetic field associated with application of commercially available magnetic wraps for 48 hours does not increase blood flow to the portion of the metacarpus underneath the wrap." Randomized trials of static magnets for treating pain were analysed, and concluded: "the meta-analysis suggested no significant effects of static magnets for pain relief relative to placebo." "The evidence does not support the use of static magnets for pain relief, and therefore magnets cannot be recommended as an effective treatment." "The application of a device delivering static magnetic fields of 300 to 500 Gauss over a pain trigger point results in significant and prompt relief of pain in postpolio subjects." Pregnancy causes a progressive decline in insulin sensitivity to ensure sufficient glucose supply to the fetus. Disturbances in glucose and insulin metabolism during pregnancy can predispose the foal to metabolic disorders associated with insulin resistance later in life. Obese pregnant mares were more insulin resistant (according to FSIGT) than non-obese pregnant mares at 300 days. However, non-obese pregnant mares were mostly defined as insulin-sensitive by the FSIGT. "The endocrine change associated with pregnancy can increase the risk for laminitis in mares. All broodmares should be monitored and managed for laminitis and endocrine disorders." Obesity and insulin resistance have several negative effects on fertility in mares. Mares that are insulin resistant or have uncorrected chronic laminitis prior to becoming pregnant may be at higher risk of laminitis. However, changes to insulin and glucose in late pregnancy and during lactation may be protective for some laminitic mares. "Pregnant mares had slower glucose clearance and greater insulin secretion at 28 weeks of gestation than did nonpregnant mares. Glucose and insulin responses to meal feeding, particularly with HS feed, were greater in pregnant mares, indicating that pregnancy enhanced the postprandial glycemic and insulinemic effects of starch-rich feed supplements." Mares with PPID may fail to conceive or have abnormal heat cycles. Persistent lactation may also be linked to PPID. Reduced levels of dopamine affecting reproductive hormones, and chronic infections of the uterus have been suggested as contributing to infertility in mares with PPID, and pergolide treatment may restore fertility and normal seasons. (McFarlane 2011). In her presentation "Is it PPID or is it EMS?" Dianne McFarlane suggested that infertility in breeding horses may be an early sign of PPID. Clinical signs reported in horses with PPID include "persistent lactation and infertility, which are probably a consequence of altered release of prolactin and gonadotrophic hormones." Can pergolide be given to pregnant/lactating mares? "Question 5: Can PRASCEND be used in breeding, pregnant, or lactating mares? Answer: PRASCEND has not been evaluated in breeding, pregnant, or lactating horses. As PRASCEND is a dopamine agonist, it may interfere with reproductive hormones involved in horses. Use only after a risk/benefit assessment by the attending veterinarian." "Pregnancy: Use only according to the benefit/ risk assessment by the responsible veterinarian. The safety of this product has not been demonstrated in pregnant mares. Laboratory studies in mice and rabbits have not produced any evidence of teratogenic effects. Reduced fertility was seen in mice at a dose of 5.6 mg/kg body weight per day. Lactation: The use is not recommended in lactating horses, in which the safety of this product has not been demonstrated. In mice, reduced body weights and survival rates in the progeny were attributed to the pharmacological inhibition of prolactin secretion resulting in lactation failure." Dianne McFarlane (Equine Pituitary Pars Intermedia Dysfunction Vet. Clin. Equine 27 (2011) 93-113) says that giving pergolide to pregnant mares doesn't seem to cause adverse effects, but it is best discontinued a month before foaling. There are anecdotal reports that the spring transition may affect mares with PPID (see ECIR Group messages 164441, 154749) and see "insulin" below. Effects of pituitary pars intermedia dysfunction (PPID), season, and pasture diet on blood adrenocorticotropic hormone and metabolite concentrations in horses. See p38 - ACTH concentrations were at their lowest in spring months in both normal and PPID horses (geldings and mares). Investigating PPID - Liphook Equine Hospital - see graph showing median and IQR ACTH concentrations by month for normal and PPID horses. "the increasing prolactin concentrations in the spring are involved with loss of the winter hair coat (Thompson et al., 1997) as well as the return of ovarian activity in mares (Nequin et al., 1993)". The ECIR group has had reports of udder enlargement, lactation, irregular cycling and cycles affecting hoof comfort in mares. Several mares with severe insulin resistance that hasn't responded to normal diet restrictions have shown symptoms similar to PCOS in women. There is little evidence that mares have the higher androgen levels found in women with PCOS. Other than around ovulation, FSH levels should be higher than LH in mares, and finding normal to high LH with normal to low FHS can be suggestive. Treatment with estrogens may reduce insulin resistance and laminitis in these mares. Owners who suspect their mares are affected should join the ECIR Group and/or contact Dr Kellon. Obesity is associated with altered metabolic and reproductive activity in the mare: effects of metformin on insulin sensitivity and reproductive cyclicity. "obese mares exhibited a significantly longer duration of the oestrous cycle, significant increases in circulating concentrations of leptin and insulin, and decreased insulin sensitivity and concentrations of thyroxine compared with feed-restricted mares throughout the experiment." (PubMed) Abstract: Peripheral insulin resistance is the failure of proper cellular glucose uptake in response to insulin. Insulin resistance and hyperinsulinemia are associated with several disease states in the horse and reproductive function disturbances in humans, including polycystic ovarian syndrome. To test the hypothesis that insulin resistance (IR) and hyperinsulinemia disrupt the estrous cycle in mares, two experiments were conducted to first develop a model to induce IR and to then examine the effect of this model on the duration of the estrous cycle. In Exp. 1, a hyperinsulinemic-euglycemic clamp (HEC) procedure was performed on seven mares to determine insulin sensitivity before and immediately following infusion of a heparinized lipid solution. The HEC procedure was repeated 1 wk after lipid infusion. Mares developed IR following the lipid infusion (P < 0.05), and some individuals maintained IR for up to 1 wk. Mares also exhibited increased blood insulin both immediately following treatment and 1 wk later (P < 0.05). In Exp. 2, induction of insulin resistance by lipid solution was not accompanied by changes in circulating concentrations of luteinizing hormone, and duration of the luteal phase, compared with the duration of untreated luteal phases. Nonetheless, lipid infusion and the resultant insulin resistance were associated with an increased interovulatory period (P < 0.05), and peak concentrations of progesterone (P < 0.05) were higher during the treated vs. untreated luteal phases of the estrous cycle. The results from the preliminary study suggest that infusion of a lipid solution may induce transient insulin resistance and hyperinsulinemia. The resulting insulin resistance and hyperinsulinemia may modify characteristics of the estrous cycle, perhaps at the level of the ovary. Ovariectomized mares and mares with inactive ovaries may show signs of estrus, possibly due to adrenal steroid hormones. Aberrant adrenal hormone production has been suggested as the cause for behavioural changes in some mares. Normal (N) mares and "problem" mares with "deviant estrous bevaviour (P) were given exogenous ACTH or saline. ACTH caused a significant increase in plasma levels of cortisol, progesterone, androstenedione and testosterone in all mares. Problem mares had a lower increase in cortisol and higher increase in progesterone. "The reason for the reduced adreno-cortical reactivity, with a low cortisol response to the ACTH treatment, in the 'problem' mares is unknown, but may indicate a difference in adrenal function as compared to control mares." Mares may display estrous signs after ovariectomy. Exogenous ACTH increased cortisol, progesterone, androstenedione and testosterone in normal (N) and ovariectomized (O) mares. Cortisol levels were not different between N and O mares. Androstenedione, progesterone and testosterone levels were lower and increased less after ACTH in O mares.
" It was concluded that ovariectomy affected basal cortisol pattern. Ovarian androstenedione and testosterone contributed to the basal circulating levels and, in the case of androstenedione, was stimulated by ACTH. Endogenous estradiol did not act stimulatory on adrenal gland hormone production in the mare." "estrous behavior seen in ovariectomized mares may be due to steroids from the adrenal cortex" ... "other adrenal steroids, e.g., androgens, may be involved in estrous behavior in the untreated, ovariectomized mare". In the UK and the EU, when a veterinary medicine is licensed in that country for that disease in that animal, the licensed medicine must be used - see Cascade Guide for veterinarians if NO authorised medicinal product is available (FVE 2013). "MMPs, historically thought to cause laminitis, do not appear to play an initiating role in the lamellar lesion. Other host derived proteases and degradation of alternative lamellar matrix components need to be considered." "MMP-2, MT1-MMP, TIMP-3 and ADAMTS-4 do not appear to play a significant role in the pathogenesis of insulin-induced laminitis. The increased expression of MMP-9 may be associated with the infiltration of inflammatory leukocytes, or may be a direct result of hyperinsulinaemia. The exact role of MMP-9 in basement membrane degradation in laminitis is uncertain as it appears to be present largely in the inactive form "
Metformin (Glucophage) is a drug licenced for humans that is frequently prescribed for horses with hyperinsulinaemia/IR/EMS. Metformin is generally available in 850 mg or 500 mg tablets. In humans, Metformin is excreted by the kidneys and does not undergo hepatic (liver) metabolism. When should Metformin be used? Cathy McGowan (Aug 2011 Prascend webinar) said that Metformin is “exercise in a tablet”. If a horse has laminitis and it cannot exercise and is clearly IR, something has to control the IR/symptoms, dieting does work but it takes time, so use Metformin immediately in cases that cannot exercise. When the horse can exercise, reduce and stop the Metformin. Metformin is not a harmful drug, no side effects shown (to date), so no harm in going on longer than perhaps necessary. Andy Durham (Aug 2011 Prascend webinar) said that he believes in using Metformin. Its action isn't fully understood - It might not be a peripheral insulin sensitiser, it might inhibit carbohydrate absorption from the intestine and thereby keep glucose down (see Durham et al. 2012 below), thereby reducing the insulin response. So even if it isn’t particularly affecting insulin levels, it may still be helping to prevent/reduce laminitis. Nicholas Frank (EMS and Ponies 2011) said that drugs should never be used as a substitute for diet, exercise and management changes, but that Metformin can be used for ponies that remain insulin resistant after weight loss and despite exercise - it might be prescribed in approx. 10% of cases that do not respond as well to diet and weight loss as the other 90%. What is the dose for horses? There isn't an exact dose of Metformin for horses. It was first used in horses at lower doses, now vets are increasing the dose and/or giving it more frequently. Metformin does not appear to be well absorbed in horses. Andy Durham of Liphook Equine Hospital suggests 30 mg/kg bodyweight twice a day (15 g 2 x day for a 500kg horse) (Aug 2011 Prascend webinar). Cathy McGowan suggests 15 - 20 mg/kg bodyweight three times a day (7.5 - 10 g 3 x day for a 500kg horse), or 25 mg/kg bodyweight twice a day (12.5 g 2 x day for a 500kg horse) (Aug 2011 Prascend webinar). Giving 30 mg/kg bodyweight metformin 60 minutes before a rice bran feed containing 0.5 mg dextrose (glucose) per kg bodyweight led to reduced glucose and insulin levels compared to controls. Metformin may accumulate in the intestine at much higher levels than in blood. In rats, Metformin delays the absorption of glucose by the intestine and increases glucose utilization by intestinal tissue. In mice, concentrations of Metformin in intestinal tissue decline rapidly after peaking 2 hours after administration. "Whether the effects of metformin on the equine intestine are of sufficient duration to result in clinical benefit remains to be determined." It is hyperinsulinaemia rather than insulin resistance per se that appears to cause laminitis in horses. The paper suggests that the insulin lowering effects of Metformin might reduce diet-induced hyperinsulinaemia even in the absence of insulin sensitizing effects. It theorizes that by reducing glucose absorption, Metformin may also lower calorie intake and help weight loss (however, in horses, presumably glucose not absorbed in the small intestine will pass to the hind gut where it will be fermented to volatile fatty acids, therefore still provide calories. Also might this risk acidosis, as normally very little glucose will pass to the hind gut?). "The potential benefit of these effects in horses fed appropriate forage that is low in nonstructural carbohydrates versus more glycaemic diets, such as grass, forage with a high nonstructural carbohydrate concentration and cereals, may be questionable". The horses used in the research were all healthy, and although insulin resistance was induced by giving them dexamethasone, this may not reflect natural insulin resistance/EMS. "In conclusion, the present study indicates that orally administered metformin reduces the glycaemic and insulinaemic responses to orally administered dextrose in horses. Further work is required to determine whether these effects may translate into clinical benefits in horses with EMS and hyperinsulinaemia." A dose of 30 mg/kg BW Metformin given 30 minutes before an oral glucose test significantly reduced glucose absorption and the subsequent insulin response in all horses. A retrospective study looked at 11 horses with a history of laminitis, BCS >5/9 and insulin resistance diagnosed by CGIT. The horses had dietary restriction plus treatment with metformin at an average (mean) dose of 24 mg/kg bodyweight for an average (mean) of 28 weeks (range was 9 to 91 weeks). No significant changes in body weight or BCS were seen. There were slight but not significant improvements in RISQI, G:I ratio and MIRG, but slight but not significant increases in time taken for glucose to return to baseline and area under the glucose curve. Conclusions: "Measured and calculated indices of IS in the 11 horses with EMS described in this study did not change significantly following instigation of treatment with metformin and dietary restriction, suggesting that metformin may not be of clinical benefit in this species." After giving non-obese IR ponies 15 mg/kg BW metformin 2 x day for 21 days, "there was no significant change in SI, Sg, AIRg, DI, BW, BCS or CNS in response to metformin, or over time in the control group. There were no measurable benefits of metformin on SI, consistent with recent work showing that the bioavailability of metformin in horses is poor, and chronic dosing may not achieve therapeutic blood concentrations." Metformin in equine metabolic syndrome: An enigma or a dead duck? Vet J. 2012 Jan;191(1):17-8. Epub 2011 Aug 31. Am J Vet Res. 2010 Oct;71(10):1201-6. Am J Vet Res. 2009 May;70(5):665-8. Pharmacokinetics and bioavailability of metformin in horses. Clin Sci (Lond). 2012 March; 122(6): 253–270. Diabetes, cancer, and metformin: connections of metabolism and cell proliferation. "Metformin has multiple potential mechanisms by which it inhibits cancer development and growth. For example, metaformin inhibits hepatic gluconeogenesis, thus decreasing circulating glucose levels, and it increases insulin sensitivity, thus reducing circulating insulin levels. Intracellularly, metformin activates AMPK, which decreases protein synthesis and cell proliferation. Metaformin also reduces aromatase activity in the stromal cells of the mammary gland. Finally, metformin may diminish the recurrence and aggressiveness of tumors by reducing the stem cell population and inhibiting epithelial to mesenchymal transition." Minerals play a vital role in keeping horses healthy. Both the amount of minerals available in the diet and the ratios between the minerals are important, as too much or too little of one mineral can change the requirement for another mineral. To calculate your horse's mineral requirements, use the National Research Council's online programme, based on the Nutrient Requirements of Horses 2007.
calcium carbonate 39.4% Ca, bioplex copper 10% Cu, bioplex manganese 15% Mn, bioplex zinc 15% Zn, biotin 2%, L-Lysine 100%, magnesium oxide (heavy grade) 60.7% Mg, monosodium phosphate 24% P, 20% Na, selenium yeast 2mg/g, Vit E oil 500 IU/g, jiaogulan, DL-Methionine 99%. "Signal intensity and architectural changes within the corium and laminae were readily seen at 4.7 T, and there was a strong association with the histologic diagnosis of active laminitis. Measurements obtained with MR imaging were more sensitive and specific predictors of laminitis than those obtained radiographically. Subjective evaluation with MR imaging was more sensitive than with radiography and should become more specific with greater understanding of normal anatomy." "Features consistently noted with MR images in group L, but not detected using radiography, included laminar disruption, circumscribed areas of laminar gas, laminar fluid, and bone medullary fluid. Other findings seen only on MR images included increased size and number of vascular channels, alterations in the corium coronae, and distal interphalangeal joint distension. Magnetic resonance imaging allowed better definition of laminar gas lines and P3 surface irregularity observed on radiographs. Based on measurements, group L had a greater angle of rotation, distal displacement, and dorsal hoof wall thickness than group N; forelimb hoof wall thickness was greater than hindlimb; and distal displacement and hoof wall thickness measurements were smaller using MR imaging than radiography, but had a similar pattern. It is concluded that there are features of chronic laminitis consistently observed using MR imaging and that these may be additional to features observed radiographically." "Although MR images with microscopic resolution were obtained ex vivo, this study demonstrates the potential for detection of lamellar pathology as it occurs. Early recognition of the development of laminitis to instigate effective therapy at an earlier stage and may improve the outcome for laminitic horses." Muscle wasting (muscle atrophy, sarcopenia) is a common symptom of PPID. "Similar to other species, this study confirmed atrophy of type 2 fibers as the cause of muscle mass loss in horses with Cushing's disease." If your horse is overweight and on a weight loss diet, and/or if he has been diagnosed with EMS/insulin dysregulation but his insulin levels have now returned to or close to normal, you may want him to have some time at grass, but you need to consider how you are going to restrict his grass intake - small paddock or track system, strip grazing, limited access and/or muzzles are the usual options. ﻿How much does wearing a muzzle restrict grazing? Research has found that wearing a grazing muzzle can reduce grass intake considerably. Use of a grazing muzzle was thought to reduce grass intake by an average of 30%. Grazing Muzzles' Efficacy at Reducing Pasture Intake - Erica Larson Sept 2011 www.thehorse. Ponies were monitored for 3 hours on 4 occasions grazing spring, summer, autumn and winter pastures with and without a muzzle. Wearing a muzzle was estimated to reduce grass intake by between 77 and 83%. If you aren't convinced about using a muzzle for your EMS/PPID horse, read Linda Cowles' article about muzzles, and see the photo of Nancy, whose owner wouldn't use a muzzle. See Muzzled for Moderation by Christine Barakat and Melinda Freckleton for a good photo guide of a muzzle that is too small, too big and just right. Introduce gradually and make wearing a muzzle a positive experience - feed treats or grass through the hole to show your horse that he can eat with the muzzle on. Leave the muzzle on for short periods initially and slowly increase the time spent muzzled. 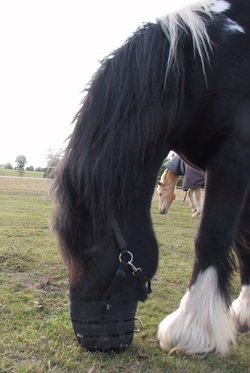 Ensure your horse can drink when wearing a muzzle. Ensure the muzzle fits correctly. Don't leave the muzzle on 24/7 - up to 12 hours is often recommended. Ensure your horse eats at least 1-1.5% of his bodyweight in fibre each day, by supplying high fibre low sugar/starch feeds such as hay or low sugar chaffs (TLS suggests Dengie HiFi molasses free as a chaff hay replacer). Remove your horse from grass when not wearing the muzzle to avoid him compensating for the grazing restriction when muzzled. All too often I hear owners say "my horse won't wear a muzzle", "he doesn't like his muzzle", and even "muzzles are cruel", and I understand, because I was almost beaten by what I saw as Homer's refusal to wear a muzzle. But he had recovered from laminitis and rotation, his insulin was in the normal range, and I wanted him to start having some grass and a bit more of a "normal" life. When I first tried using a muzzle on Homer he would go and stand in his shelter, totally depressed. He then started to run away, in increasing panic, when I approached with the muzzle, and then when I approached with anything that could be a muzzle in my hands, making it difficult to catch him. I spent hours picking bits of grass and holding them up to the hole in the muzzle, trying to persuade him that he could eat grass with it on. We even made the hole slightly bigger. For months I tried sporadically to get him to wear the muzzle, then gave up because he clearly hated it. But this meant he was spending hours in a small mostly mud paddock, eating hay, away from his friends, and moving very little. Then something I read made me realize that my attitude was wrong. I had to make the muzzle something Homer would love, and choose to wear. I started to feed him handfuls of his feed or grass in the muzzle, not putting the muzzle on but just holding it up for him to reach into, until he started to come towards me when he saw me approach with the muzzle because he knew something tasty was coming. Then I fastened it for a minute or two at a time, slowly increasing the time, still offering him something nice to eat. Then I made it a rule that he could only go out into the big field with his mates when he was wearing his muzzle - no muzzle, no grass. That worked well for a while, but then he learned to get the muzzle off by rolling and dragging it over his ears with his front legs (a Shires muzzle with a velcro-fastening headpiece (above). So it was adapted slightly and fitted to a leather headcollar (right), and he was only turned out onto grass when we were around to keep an eye on him. He soon learned that he couldn't get it off, and he stopped trying. It wasn't long before he asked to have his muzzle put on, as he always got a small treat in it, even if just a handful of the grass he was about to eat, and the other horses appeared to be jealous that Homer was getting something special. Depending on the time of year and the likely sugar content of the grass, he spent part of the day moving around a few acres with his herd, interacting and having the odd gallop, and part of the day in his bare paddock with hay and no muzzle, and his scratching partner would often join him for a while to have a good mutual scratch. He was so much happier, and if anything he lost weight and became fitter with increased, but restricted, access to grass. Homer's access to grass was dependent on his insulin results being well within normal ranges. He was exercised most days and his access to grass reduced on days he didn't exercise. Initially he had access to grass on a track system which was mostly under trees, just first thing in the morning and last thing at night, and as he showed no further signs of laminitis, his insulin remained normal when tested after eating grass, and his exercise returned to pre-laminitis levels, the time he spent grazing was increased and he was able to join his herd in the field until he was out with them most of the time. Eventually his insulin resistance was so well controlled that he was able to graze freely with no muzzle for much of each day. The Best Friend Standard Grazing Muzzle is similar to Homer's "escape free" muzzle - 4 velcro straps attach the muzzle to the horse's own headcollar. Attaching a standard muzzle to a leather headcollar with 3 leather straps stopped Homer removing it!